So for marketers who are trying to figure out how to do search engine optimization, content marketing, PPC, search engine marketing, or social media marketing on their own, we would like to help clear up the confusion. Announcing our new “Ask Us Anything” video series on YouTube! To answer your digital marketing questions, we’re launching a new video series. Do you have a question about SEO, PPC, content, social marketing, or the intersections between them? To prime the pump so to speak, we filmed answers to some of the questions that we hear from blog readers, clients, and students in our SEO training courses. 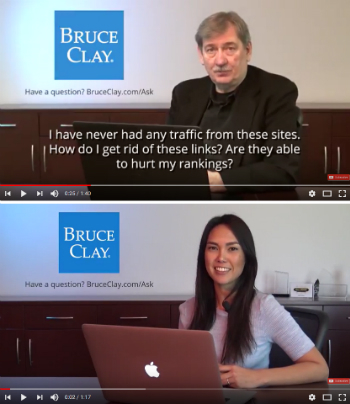 Visit the Bruce Clay, Inc. YouTube channel and you’ll find many videos already queued up in our Ask Us Anything playlist! How Do I Get Rid of Extra Pages in Google’s Index? What’s the ROI for a Social Media Campaign? How Many Words Per Page for SEO? Brief is best when it comes to video answers. You might be struggling to decide a particular optimization issue. For example, should you use heading tags in your navigation menus? Yes or no? When you’re unsure what to do, it can hold up your projects. At times like these, you just need a best-practice answer. Choose the best person to answer it — from Bruce Clay himself to the many experienced, knowledgeable members of our team. Notify you by email if we post a video that answers your question. The main goal of our “Ask Us Anything” videos is to provide reliable answers to SEO questions and other issues facing digital marketers. Helping you understand the best practices better means that you can do your job more efficiently — with better results. We hope you enjoy watching, learning, and getting your questions answered in our new video series! Please subscribe to Bruce Clay Inc.’s channel and watch all of our video answers. And go ahead: Ask us anything! Its interesting because what one think (have a doubt) is there in the blog in answer. So inspite of writing questions i personally feels grateful of Bruceclay. Thank You for sharing the valuable & informative blog. This video series is a great idea. Never enough content creators talking about online marketing strategies. Thanks Bruce! The design of your site implies color scheme, format, text organization, and many other little contemplations. It needs to look great, however, it additionally must be pragmatic and simple to utilize. We make it a priority to find out about our customer’s needs, preferences, dislikes, and any thoughts they may have for the website before making a blueprint for development. AdWordsWise: We’re excited to hear how our video helped you overcome that indexing problem. Thanks for sharing your results and also for sharing our Ask Us Anything series! Thanks, Bruce for sharing the video guides. I am into digital marketing and faced some issue related to the indexing of unwanted pages in Google SERP, but after I watched the video by Mr Bruce about “How Do I Get Rid Of Extra Pages in Google Index” I was able to remove such pages from the SERP. Also shared that video on my social media channels. Lee: We appreciate your support! We’re committed to this project, so you can expect more in the future. 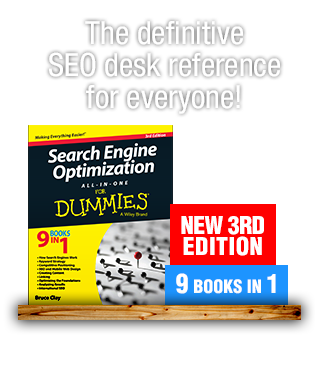 Hey Bruce and team, this is a great resource for some of the most commonly asked SEO questions. These videos are so underviewed!! Keep up the great work, it’s keeps the industry learning moving forward. Wow.! I had a question related to search featured snippets before coming to this article and after I watched the video, I can say that getting featured in Google SERP is not that difficult, we just have to play with the content. “Ask you anything video series” is so impressive. Yeah, you are right Digital Marketing is very tough. 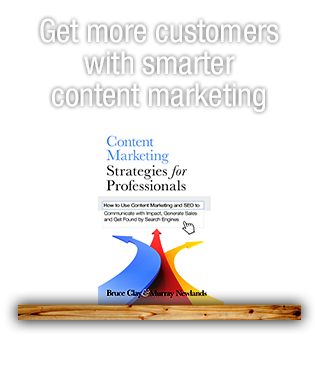 Thank you, admin, for sharing the series of Bruce clay for Digital marketing. I sure I will subscribe to your channel. Hello Bruce, in relation with Digital Marketing what tactics could you do suggest if I have an upcoming site and I want people to know about it and read it and also why do I need to have Digital Marketing when it comes to having an online site. I have a question: Will updating Google Plus page become obsolute now when GMB posts are getting more used? Maybe we should just concentrate on GMB posts and just leave Google+ page as it is? Hi Bruce. I want to know is website organic traffic growing in year 2018? This blog is really amazing. You have done all this work and you are offering it for free. It just an amazing, this tips are exciting and give the result. Bruce, you are a genius and you help a lot of people by providing correct and right information from your blog. Nice update, This way anyone can clear their doubt about SEO marketing. Did you guys face any google algorithm hit? I totally agree, digital marketing is tough but thanks for the valuable tips and it will surely help. 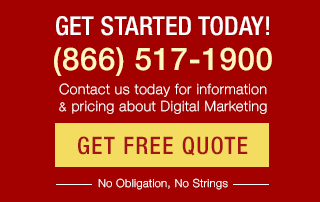 Digital marketing optimization starts from the design of a site. To construct a great content-rich website takes planning. A competent designer uses online architectural design principles, carefully combining information delivery and intuitive navigation to satisfy the visitor’s needs while accomplishing their own business goals for fame or fortune. I have been an avid reader of your blog and now I will also be able to get amazing video content. Thank you so much. Digital marketing video series? Yes, please. This is a great idea because I feel most of us have the same questions but often find confusing or even conflicting answers. You mentioned SEO, and I am aware that what worked back in 2015 may hurt my blog in 2018, but for a beginner, it’s very difficult to find the answer that is relevant. Video series are always easier to follow, at least for me. Jacwan: Questions always come up, so feel free to ask. Hello Bruce, you always rocking with your ideas. which are very helpful to us. Next time I will ever have a doubt about digital marketing I will soo excited to ask you in the video session. Thank you. Thanks for this series. Now We will learn from SEO pro. Hi Bruce. You and your team never fail to amaze me when it comes to delivering great content and useful information. 9Series: We hope this is helpful to many people. Remember, you can submit questions for this video series too! Thanks for sharing such a useful resource here.